After 1month ish i have spent weekend at home, i was out to visit lydia. YC and Danny were picking me while KP was by himself. It has been awhile we were not meet, since my birthday party they got me at lydia's old restaurant. Everyone is busy with their schedule, and time flies till we didnt realize how much time we were not in touch. But glad that our friendship is still remain. 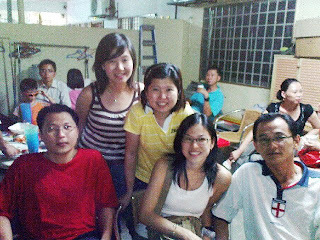 These people are the closest one that we have grown up together.. With lydia, we used to be enemy during primary school; with KP, we were primary school love fighter; with YC, our big sister in high school.. Danny is YC's boy, knew him since 2006. Each of us is having different life, lydia has engaged with kelvin for almost 10yrs; KP got married for 2yrs with no little one yet; YC and Danny are getting better; while me, am still a lone ranger.